When Kathleen came to the house, I happen to have my friend Lisa’s Christmas Chocolate Balls which are Gluten free to serve her, but it made me realize how challenging it can be for someone who has Celiac . 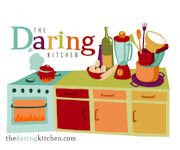 So when the Daring bakers challenge was gluten free Nanaimo Bars, I was thrilled to participate – not only because it involves making gluten free wafers, but I AM CANADIAN!!!! 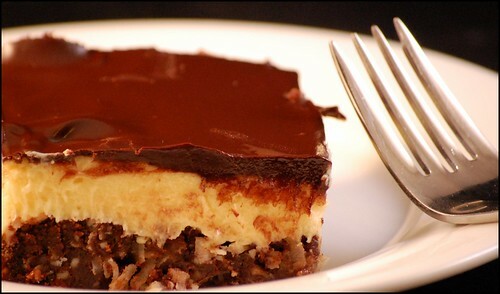 Nanaimo Bars are a classic Canadian dessert created in none other than Nanaimo, British Columbia. In case you were wondering, it’s pronounced Nah-nye-Moh. 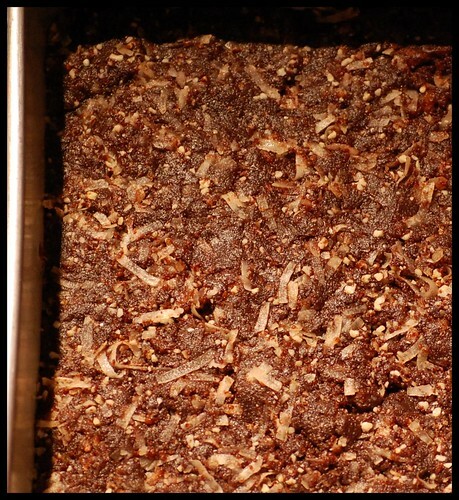 These bars have 3 layers: a base containing- graham crackers, cocoa, coconut and nuts, a middle custard layer, and a topping of chocolate. They are extremely rich and available almost everywhere across the country. 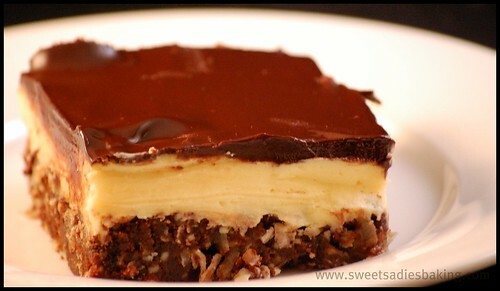 And of course the Olympics are in Canada this year so let's celebrate with Nanaimo Bars! The Gluten free element is really the wafers which make up the first layer. It was very easy to make them and you can't tell they are gluten free. Ingredients - The wafers are great to have around but you can make half the recipe for these Nanaimo Bars. 1. 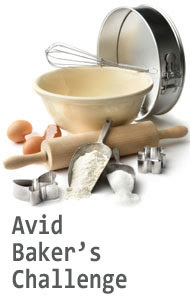 In the bowl of a food processor fitted with a steel blade, combine the flours, brown sugar, baking soda, and salt. Pulse on low to incorporate. Add the butter and pulse on and off, until the mixture is the consistency of a coarse meal. 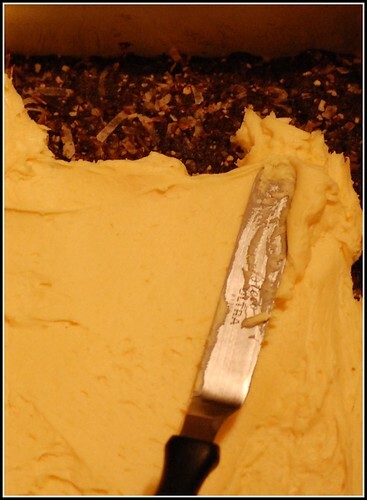 If mixing by hand, combine dry ingredients with a whisk, then cut in butter until you have a coarse meal. No chunks of butter should be visible. 4. Divide the dough in half and return one half to the refrigerator. Sift an even layer of sweet rice flour onto the work surface and roll the dough into a long rectangle, about 1/8 inch thick. I rolled the dough directly on the parchment paper. The dough will be quite sticky, so flour as necessary. Cut into 4 by 4 inch squares right on the parchment paper. Gather the scraps together and set aside. Move the parchment paper with the wafers onto the baking sheets. Chill until firm, about 30 to 45 minutes. Repeat with the second batch of dough. 8. Bake for 25 minutes, until browned and slightly firm to the touch, rotating sheets halfway through to ensure even baking. Cream butter, cream, custard powder, and icing sugar together well. Beat until light in colour. Spread over bottom layer. Melt chocolate and unsalted butter over low heat. Cool. Once cool, pour over middle layer and chill. These bars freeze very well, so don’t be afraid to pop some into the freezer. Remember this dessert is very rich so a little piece is all you need. Now sit back and enjoy a taste of Canada! Love it! I love how definited your layers are. My chocolate layer seemed pretty thin so the filling sort of leaked into it. Thinking of you!